Miami, Florida. 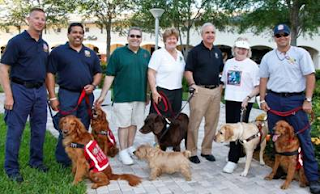 March 27, 2012— Over 150 walkers with their guide dogs, service animals and regular pet companions pledged support for the Miami Lighthouse for the Blind and Visually Impaired to raise awareness for the amazing work service animals provide to those who are in need. The Miami Lighthouse held their fifth annual Walk, Waggle and Stroll Dog Walk at the Shops at Midtown Miami on Sunday, March 25th. This year’s event was hosted by Honorary ‘Dog’nitary Miami-Dade County Commissioner Sally Heyman with WPLG Channel 10’s Sasha Andrade as emcee. Miami-Dade County Public Defender Carlos Martinez, County Commissioner Sally Heyman, Miami-Dade County Mayor Carlos Gimenez, President and CEO of Miami Lighthouse for the Blind Virginia Jacko with Miami-Dade Fire Rescue Urban Search and Rescue Team. The Miami Lighthouse Dog Walk was sponsored by The Shops at Midtown Miami, Brickell Motors, Met Life, Miami-Dade County Commissioner Sally Heyman, Gray Robinson, Banfield Pet Hospital, Frances T. King Insurance Agency, Milton and Patricia Wallace, Rugsies Carpet & Drapery Cleaning, BizSolutions, Britto, WPLG Local 10, Susan Conroy Design, Absolute Graphics, Brooklyn Bagels, Fuze and Miami Global Colombian Lions Club.